If you’re preparing a move to Japan and wondering how accessible English-language books might be, this post is for you (or if you’re in Japan already and want a few more ideas, or have some great ideas to share with us). Though in some cases acquiring them may be less convenient (or more expensive) than your home country, rest assured it is possible to English books here without resorting to paying an arm and a leg to have Amazon in your country ship them to you. Many municipal libraries throughout Japan have a small section of English books, though the selection varies depending on the library and area you’re in. For example, the English section at my local library (I’m in a small-sized city) has several classics, the Harry Potter series, Little House on the Prairie series, Anne of Avonlea series, a selection of books about Japan and Japanese culture, some cookbooks and “living in Japan” related publications, and some modern fiction. Not a large selection as all of these only fill one tall bookcase, but a selection nonetheless. If you live in a large city, you would likely find more of a selection. Worth a look in any case, and it’s also a good chance to find Japanese books to practice your Japanese. Bookstores in larger cities typically have a sectioin devoted to “foreign” books, which usually includes mostly English-language books. You’ll most likely find a decent selection Japanese study books and materials in this section as well. Most have many of the classics, books on Japan and Japanese culture, and it’s also likely you’ll find more recent releases of novels and non-fiction (typically books you’d see on recent bestseller lists). Rest assured Amazon Japan has a pretty wide selection of English-language books, so if you can’t find them at a bookstore, it’s quite likely Amazon Japan will carry what you’re looking for. (Though, there are some books I haven’t been able to find on the site: usually those published years ago and not very popular. You can find plenty of books published in the past, though.) Shipping is fast and cheap. If you have a Kindle, Nook, iPad, smartphone, an e-reader of some kind, or something with an e-reading device (your computer technically counts, too) you can purchase eBooks from Amazon, Apple, Barnes & Noble, among others, or find free ebooks online. Though not necessarily found everywhere in Japan, some cities or regions may have a book club or group of expats willing to trade or lend books. It’s best to ask other expats in your area if they know of any group like this, or maybe check for groups on Facebook or Meetup. eBook lending is a newer option, and one that I have yet to take advantage of, though I’ve been meaning to try it out. For Kindle users, some books are allowed to be lent to others (with certain stipulations), and a few recent start-ups (listed below) have taken advantage of this to allow for community lending. Essentially you sign up for the service, add the titles of the books you own, and search for books to “borrow” from others, just as they can “borrow” titles from you. (Keep in mind though that the "lendable" books are restricted by publishers, etc., so the selection is not yet that extensive). More on Amazon’s lending program here. I’ve also seen that some libraries in the US have already started implementing eBook lending services - something to keep in mind if you have an account at a library in the US (particularly in large cities). I haven’t been able to try this out yet as I seem to have lost my library card to the library system I used in the States (and for some reason it’s quite a hassle just to get a replacement). On a similar note, does anyone know if libraries in other countries lend out eBooks? 1. Secondhand shops/stores* - A few commenters mentioned secondhand book stores or shops. Definitely worth looking if you're in a large city (even just to visit). In my experience, smaller cities don't usually carry English books aside from what students use at school, so that may not be as helpful, but if you live in or near a larger city, might be fun to browse! *Thanks to Leah, jonallen and @LongnoseRob. 2. Ordering from your home country (or another country)* - This may or may not be expensive, and was something I didn't include as I only wanted to focus on options within Japan. However, if you can't find what you need here in Japan or online, it may be worth ordering from overseas. *Thanks to Danielle and gavin. 3. Similar to the e-lending sites above, except for actual books and not ebooks, is bookmooch.com. Make an account, enter in books you want to give away (and mail them to others once requested), and request books from otheres. *Thanks to @goodandbadjapan. 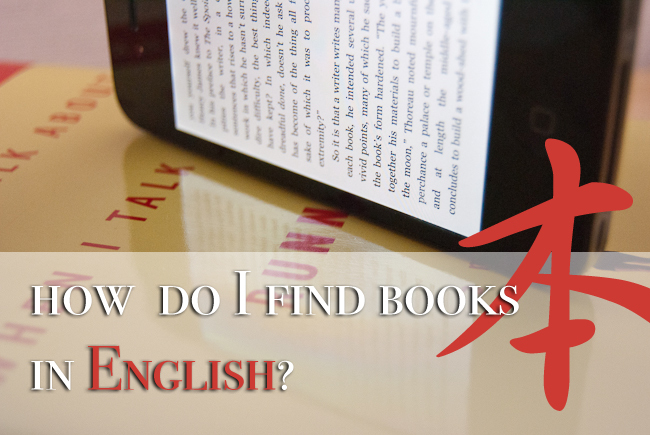 Do you have any other tips for finding English-language books in Japan? Q&A: Making friends in Japan?